If gorgeous beaded jewelry always catches your eye, you'll love making (and wearing ) your own necklaces, bracelets and earrings. 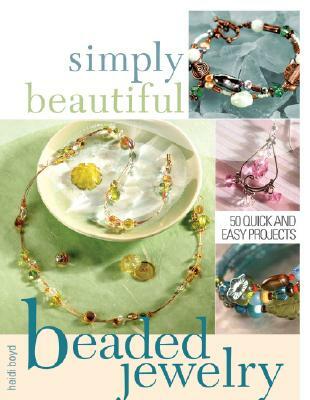 "Simply Beautiful Beaded Jewelry" includes 50 projects plus variations in designer Heidi Boyd's simply elegant signature style. Inside you're bound to find plenty of designs to strike your fancy as well as a helpful section that shows you the basic supplies and techniques you'll need to get started. As an added bonus, many of the projects have variations in different colors and styles to help you customize your jewelry to your personal style. &break;&break;Just think how proud you'll feel the first time you can answer, "I made it myself" to a compliment on your fabulous new multistrand necklace or your sparkling, swingy crystal earrings. With "Simply Beautiful Beaded Jewelry," it truly is easy to get startedin no time at all you'll be showcasing your own original beaded creations and making them as gifts.